Enjoy the incredible Medano Beach of Cabo San Lucas from a private villa with all the amenities of a five star resort! Villa La Estancia offers the comforts of home as well as 24 hr. front desk concierge service, 24 hour security, ocean and pool side restaurants, fitness center, jacuzzi, pools with swim up bars and tennis courts. It is just a short walk on the beach to additional restaurants and activities. Just a 20 minute walk to town. In addition the facility features a supermarket, deli, ice cream parlor, pharmacy and gift shops. You also have signing privileges at the two adjacent resorts - the Villa Del Arco and the Villa Del Palmar. Our villa is 2216 sq. ft and has undergone a stunning renovation...you will love it! Our rates reflect the rental of the entire Villa due to our remodeled floor plan. While the majority of Villas are split into two sides, or 'lock offs' that require two keys, ours is not. Instead, our newly designed front door and entry way immediately opens up into the front room giving the Villa a feeling of 'home' rather than 'hotel'. What was once the 'B' side or 'lock off' is now a second bedroom with a normal bedroom door lock. We find this makes it much easier for parents with children to go in and out. Our villa is centrally located on the 3rd floor with easy access to all of Villa La Estancia amenities. From the expansive veranda our villa offers spectacular ocean and pool views as well as a wet bar and bbq. The master bedroom has a king sized bed, sitting area, private bath with jacuzzi tub and separate shower. The second bedroom has 2 queen sized beds and private bath. Both bedrooms, as well as the living room, have direct access to the veranda and cable TVs and DVDs. Marble flooring and granite counters throughout, well equipped kitchen with eating counter, dining area, washer/dryer and private wifi. In addition we are able to arrange substantially discounted transportation to and from the airport, snorkeling trips, sunset cruises, fishing trips and water related activities. Please contact us by e-mail or phone to book your ultimate vacation! Our first visit to Cabo San Lucas was for our honeymoon in 1994. We left Cabo wanting to return and look for a property of our own. 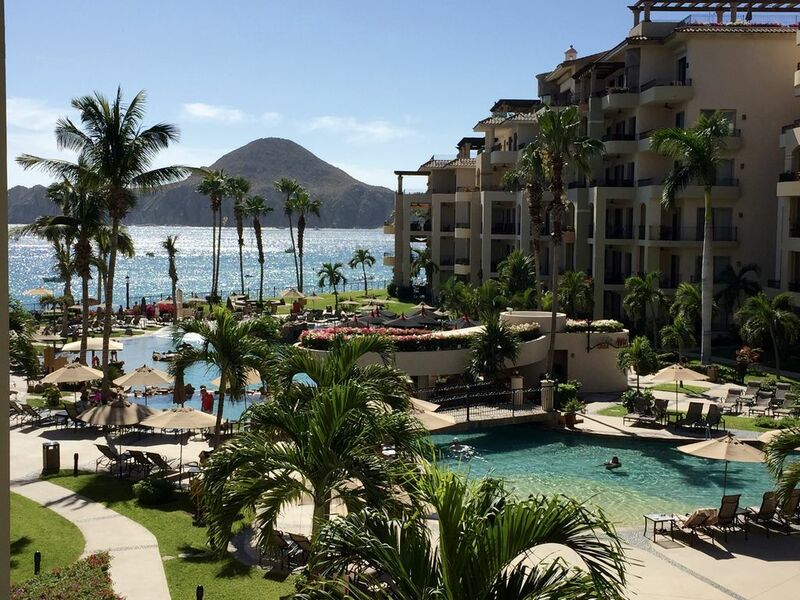 After numerous trips to Cabo San Lucas over the years, we found Villa La Estancia. Our piece of paradise. Villa La Estancia is a beautiful resort on Medano Beach within walking distance of restaurants, bars, night life and the marina. Also, a great location for any and all water activities. 24 hour concierge, security, private physician on call, supermarket, deli, ice cream store, Internet cafe, pharmacy, state of the art fitness centers, sauna, steam rooms, gourmet restaurants, swim up bar, waterfalls, children's pool area, catering available, private massages available(as are ocean front massages). Very nice property. Service was great. Our unit was spacious and perfect for our family. The property and service were above expectations. Most amazing place to stay! We (Family of 5) stayed one week in Serena's place and the moment we walked in the unit, we were so excited that it looked even more beautiful and was way bigger than expected. The place is meticulous, all the decoration and furniture is new and very modern. The unit has anything you need for a vacation: fully equipped kitchen, washer & dryer, laundry detergent, bathroom supplies, TVs in both bedrooms and the living room as well as a spacious balcony with grill. The view out on the water is stunning. The kids shared the second bedroom with 2 beds which was plenty of room. There are a total of 3 bathrooms with full showers. We absolutely loved it and highly recommend this place. We also enjoyed access to the two other resorts Villa D'Arco and Villa Palomar and access to all amenities including restaurants and activities of the 3 resorts. Villa Estancia is a private residency (the other resorts are hotels) and guests from the other 2 adjacent resorts are not allowed access which makes this property a less crowded resort and we liked that. The supermarket on the property is more expensive but very convenient (good to grab water, milk, fruit, breakfast items). There is also an ATM on the property but you can only get Mexican Pesos. We highly recommend doing the 2.5 hours ATV tour (sand dunes and beach); we booked through a tour agency/broker located in the marina of Cabo San Luca. Also very convenient is that you can walk to downtown either on the road or along the beach. It's only takes 20 minutes and we always felt very safe (or you can book a taxi though the front desk for a basic fare of $9 plus $1 for each additional person over 3). Serena is a fantastic host and always very responsive and accommodating! If you look for a Villa at La Estancia, definitely book this one. Thanks Serena for making this a wonderful vacation. Our stay in 1305 was nothing short of "great". The resort was clean and close to everything. The condo was spacious and the décor was perfect. We have been to many places and by far, this was our best vacation so far. We will be staying at Villa la Estancia again real soon. We had one of the best vacations ever at this condo in Villa La Estancia. The condo is beautifully decorated with a fabulous view and very comfortable for a family of 4-6. The people were so friendly and nice and we enjoyed using the adjoining restaurants also but loved coming back to beautiful Villa La Estancia. We walked to town a couple of times but it is a short taxi ride as well. This was our first time in Cabo and will return to Villa La Estancia and Serena's condo (1305). We also rented the condo next door (1304) which made it just perfect for our family of 9 people. Thank you for sharing your beautiful home on VRBO! Our trip to La Estancia was amazing. The unit is beautifully furnished and the beds are very comfortable. The entire resort and unit are immaculate. Serena was wonderful to work with and she even coordinated our airport transportation and a fantastic boat trip on La Gringa which I would highly recommend. We will be renting from Serena again next year! A great facility and we will definitely be back.